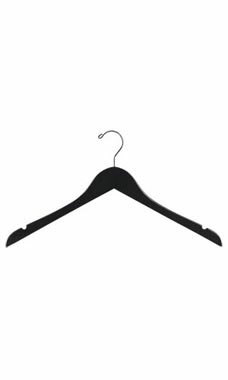 If you're looking to upgrade your store's hangers to something more sturdy and reliable, then these 17" Black Wooden Dress Hangers are a perfect solution. A dashing addition to your collection of elemental store supplies, dress hangers are our most popular style hangers, and a must-have for retailers creating merchandise displays. The chic black finish of this 17" dress hanger flatters any garment and highlights the colors in a complementing fashion. The silver metal hook provides extra strength and durability on these all purpose wholesale wooden hangers. Sold in cases of 50.